Disney is always fun to work with and the photo booth tour for the film release of their children’s film ‘Planes’ was no exception. Disney wanted to create a branded photo experience in shopping centre across the UK aimed at creating a buzz around the film release. Starting in Edinburgh during the Edinburgh Festival we toured 10 shopping centres across the UK. The experience involved taking one large 7x5 print against a digital cartoon sky background and presenting the finished result in a Planes branded frame. As there was only one photo being taken we made sure to have the ‘redo’ function activated on the photo booth so that the user could take their photo as many times as they would like before it was printed. 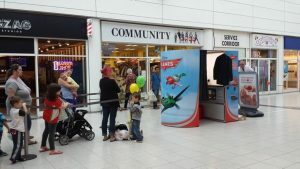 The photo booth itself was fully branded, staff were dressed as Pilots and there was merchandise available at each location. The photo booth inevitably created a queue and increased dwelling time in the area resulting in merchandise being eagerly purchased but impatient children waiting for their turn. A detailed report was created for Disney including photo booth usage (ages/gender etc), merchandise sold and feedback about the film itself.